A charity Christmas single featuring Shane Filan stars a number of teenagers from Galway. 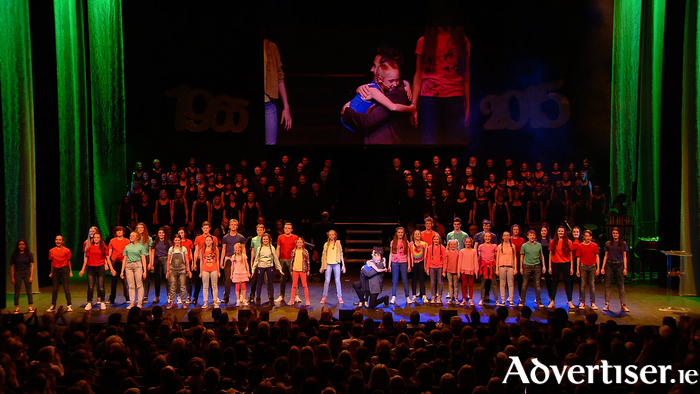 'When I Grow Up' was recorded in the Bord Gáis Energy Theatre in October, and is masterminded by same team that created 'Tiny Dancer A Song For Lily-Mae' in 2012. That tune was the second biggest selling charity single in Irish chart history, second only to the 1985 smash hit, Band Aid's 'Do They Know It's Christmas'. The producer of 'Tiny Dancer', Stephen Macken, once again teamed up with the Association of Irish Musical Societies to create something very special. More than 230 voices joined together with a 16 piece orchestra to record 'When I Grow Up' from the Royal Shakespeare Company’s award-winning production of Matilda The Musical. The project has received the approval of song-writer Tim Minchin who has allowed a royalty free use of the song. Matilda was played by 10-year-old Grace Lee from the Isle of Man who, in her short life, has had 10 heart procedures for congenital heart disease and suffers from chronic lung disease. Grace has already performed as Matilda with the Matilda West End cast thanks to ITV's Surprise Surprise television show, and because she epitomises everything that the song stands for, courage, resilience, and, above all else, hope. Beneficiaries of the proceeds of the charity single are the Children's Medical Research Foundation, Crumlin, and the Royal Belfast Hospital for Sick Children. Galway teenagers Emily Macken from Oranmore, Laura Ní Cheallaigh from Castlegar, David Kennedy from Ballinasloe, Alan Kelly, from Tuam and Conor Walsh, also from Tuam are part of the production. Stephen Macken explained why this particular song was chosen. "I chose 'When I Grow Up' because of its deeper meaning in the context of its portrayal of the simple childhood dreams and ambitions that we all once projected into our adult lives, eating sweets all day, climbing taller trees, no longer fearing monsters, and how those dreams and ambitions are the same for all children, including those who face an uncertain future due to illness and who may never live to see their fulfilment. It's that context that makes the song so special and meaningful." The recording is dedicated to the memory of Jack Lam from Castlebar in Co Mayo. Jack died in November 2013 from complications arising from treatment for neuroblastoma. Jack was part of the original social media campaign set-up by Stephen Macken to create awareness of the recording. Stacey McHugh, Jack’s mum, says she is honoured that Jack will be remembered this way, and that if Jack’s story encourages people to support this project and raise funds that might help save a child’s life then it makes her happy. The single can be purchased on iTunes, GooglePlay and all digital download stores. The CD is being sold exclusively by HMV Xtra-vision, and 100 per cent of the sales revenue, will be returned to the organisers for the benefit of the two charities. Page generated in 0.1992 seconds.